The Split Storyboard dialog box allows you to separate the current project into two different projects, which can be shared and edited independently. You can choose to export one half of the project into a different project and keep the other half in the current project, or you can choose to split the current project into two new projects and keep the current project as an original copy. IMPORTANT If you intend to split your project into two new projects, then import the changes made in the two new projects into the original project using the Merge and Replace dialog, it is highly recommended to lock you project's scene and panel numbers before splitting your project. To do this, in the top menu, select Storyboard > Lock Scene and Panel Names. For tasks related to this dialog box, see About Project Management. In the Timeline, move the timeline playhead to the panel where you want the split to take place. NOTE You can choose in which project the current panel will go later. Select File > Project Management > Split. Exports all panels before the selected panel into a new project. Using the Browse button, you can browse to the location where you want to save the first half of the project, and type in its project name. Includes the selected panel in the first half of the project. 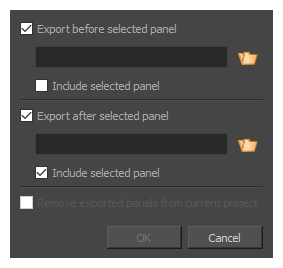 Exports all panels after the selected panel into a new project. Using the Browse button, you can browse to the location where you want to save the second half of the project, and type in its project name. Includes the selected panel in the second half of the project. Removes the panels you selected to export from the current project. If you do not select this option, the current project will preserve a copy of the panels getting exported into new projects.